Yesterday I was working from another office. At lunchtime my boss called me and told me that Facebook was blocked on the computers in the office. I checked this morning, and it’s true. Life as we know it is over! Actually, I’m quite happy about it. I used to spend far too much time on there, and I lived without it for the first year I was here, so I can live without it again. Twitter though; that’s a different matter altogether! Live without Twitter? How the hell am I going to do that? I’ll tell you what it does mean – it means I’m going to get more writing done. It means I’m going to read more people’s blogs that I don’t find the time to read now. It probably means I’ll do my new job upstairs better, and without distractions (I’m staying working at the same company when I move jobs). It’s sad, but it’s not the end of the world. In fact, part of me wishes they’d done this before. Lets face it, if they hadn’t have done it now, I’d be on one of them now, not blogging. Then I’d blog this afternoon, and wouldn’t have time for writing. This way I’ll have all afternoon for writing. Oh, if only it was NaNo this month! NaNo. Well. Obviously I’m going to have a lot to say about this for the next month. In November I may have nothing to say about it, or anything in fact, as I may be writing a novel and not have time for blogging. I don’t know. Yesterday I read a really good article over at Write Anything about preparing for NaNo. It scared the hell out of me. I took notes from it, and plan to use them. But… Planning… For NaNo. I’m not talking novel panning here, I’m on that, that’s fine. I’m talking planning when to write, how to write, arranging life to incorporate writing that much EVERY SINGLE DAY. Agghhhh. Last year I knew I had 10 days off to recuperate from an operation. I’d never had an operation before, so was under the impression I was going to have 10 days at home writing. That was my preparation. I was going to fly through it. Five days after I got back from hospital, when I was still sleeping most of the day, and in agony the rest of the time, I realised this was slightly a wrong assumption. Turned out I had two weeks off, and only on the last few days was I able to write. Then as it got closer to 31st October I realised I couldn’t do it. I had too many words to write. But, I didn’t want to be a failure. So I pulled a couple of ALL DAY writing days. I mean ALL day. 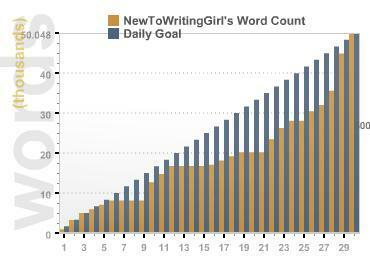 This is my word count graph. It’s not totally accurate as there was at least one day where I didn’t get my word count in until after midnight, so it posted on to the next day. Still… It’s pretty impressive. I forgot about the other none writing days. At the beginning of the month, I got a stomach bug, and wasn’t up to writing! This year, I’d like my word count to be more in line with the goal count. Anyway back to what I was saying. I didn’t prepare last year. Having read the Write Anything article, I think I should this year. Especially as I worked out something last night. Just before midnight I realised I couldn’t put off writing for NovelPI any longer. With 15 minutes of the day left I started typing. 10 minutes later I had 300 words (50 over my goal for the day – result). So. If I write 300 words in 10 minutes, to write 1,667 words, I’ll need 55 minutes. And that’s presuming I will just be writing, not thinking. I’ll need A LOT of thinking time too. So basically I need well over an hour a day. Last night that was pretty scary. Today… actually it doesn’t seem too bad. I’m going to try to get 15 – 30 minutes in each day during my lunch break (work days). Then after dinner, I’m just going to have to write. None of this watching TV rubbish like last night. I guess if I go out in the evening, I’ll stay back at work and do some before I go out. Some weekends will be easy. I have nothing planned, other than working my 2nd job on the Saturday day for a couple of them. Others will be hard, with the job then going out in the evening too. But, I don’t start until 12, which means I can easily get an hour or so in before. Who needs sleep anyway? Ok, so it’s a lot, but it’s not impossible. I’d like to ‘bank’ some words at the beginning so that if I slip up (I’m thinking hangover here, or not being able to say no to an unexpected night out) I’m not going to get that far behind. I’ve also got six days holiday to take before the end of the year, so I may take a few to write. I might even go away somewhere for a long weekend and write. Who knows. What I do know, is that I’m GOING to write 50,000 words in 31 days! I’ve done it again – read another book without updating my side panel. Well, I was reading Husbands by Adele Parks. It was great (it was Adele Parks, of course it was going to be great!). What I liked the most (looking back) was that the ending wasn’t predictable, I love that. I’ve now started reading a book I’ve been thinking about re-reading for ages. Summer Dreams, Winter Love by Mary Francis Shura. It was my favourite novel as a teenager, in fact it’s the only book I ever remember reading more than once (I think I must’ve read it at least a hundred times!). I was a little worried about picking it up, what if it’s not as good as I remember it being? That will be my favourite book wrecked! However as I’m hovering round the idea of a YA novel for NaNo, I thought now is a great time to read it! What has really annoyed me about it, and I’d forgotten, is that there’s writing all over it. When I was a teenager (maybe about 14) I lent it to one of my friends, who proceeded to write notes all over it – joking notes to me from her and another friend. They ruined my book! Not happy. It’s only in pencil, so in theory I could rub it out, but then there’s the risk of creasing the pages etc. How can someone do that to a book?! Needless to say, I never lent her another book! So, NaNo! I don’t know what to do. I guess I have ideas, so that’s good; but I have two ideas and am not sure which to go with, not so good. Months and months ago, my boyfriend came up with a rough idea for a novel. He thought he wouldn’t be able to write it, so told me about it. I loved it, and wrote a rough plan of what could happen, and gave it a totally rocking title. It’s been going round my head ever since, so maybe now’s the time to do something about it? I’ve got this other idea. It’s a YA, kind of romance/friendship novel. I know a few things about it, and keep thinking up more. I’m really quite excited about this (except the title’s not as good as the other one, in fact I’ve not even really decided on the title yet). The problem with both is that I’ve not done enough reading in either genre recently (forget the book I’m reading now, I really should be reading current novels, not 20 year old novels!). The problem with the black comedy, is I’m not sure I can write funny. Another problem with both of them is that I don’t know what’s going to happen. I want to know what’s going to happen because when I wrote Italian Infatuation last year for NaNo, I had a plan of what was going to happen. It wasn’t in that much detail, just: Day 1: blah; Day 2: Blah blah, etc. As I wrote, I filled in the detail but always knew the overall picture. That maybe why I’m not doing as well with Holiday (I NEED to change the title of that, I hate it) – I know what happens at the end, but no idea in the middle, not even roughly! My plan to decide which one to write is to sit down and plan them both. From that I hope I’ll see that I’ve got more for one than the other, and will hopefully be more excited about one. Hopefully. I’ve just been on the NaNo website, and signed up again. That’s it, I’m in, no getting out of it now. Not that I was going to anyway. From 1st December last year (the day after NaNo finished) I knew I’d do it again. There must be something wrong with me. We’re on day 4 of Novel Push Initiative. I’ve successfully completed days 1-3 – woop! I signed up to 250 words a day, and just like last year, I’m doing loads more. I can’t check how many I’ve done, but I must be on 1,000 plus. In just three days. Result. You may ask why I can’t check? Cause Twitter’s blocked here at work. NOOOOOOOOOOoooooooo! And Facebook. Facebook I think is a great thing, I check it far too much at work, and seeing as I’m about to start a job where I need to work, I’m happy with that. But Twitter???? What am I going to do without my daily (ok, almost hourly then) Twitter fix?? This just goes to prove I NEED to get one of those phones that have excellent internet etc. I’m tempted my an i-phone, but someone very close to me hates them with a passion, and has made various threats if I get one… Hmmm… My current contract’s not up until November so I’ll look then I guess. Oh yes, just in time to be a NaNo distraction – excellent!! At the moment I think I can beat anyone to that title. I am at home on a Saturday night (as I’m working both weekend days and waitressing tends to tire me out so much I don’t want to do anything else), so really should be taking this opportunity to edit this chapter for the Mills & Boon New Voices competition. You know, the one whose DEADLINE is WEDNESDAY. I’ve been sat at my computer for 2 1/2 hours and guess how much I’ve done? Well, the fact that the paper copy I started editing on Thursday is still in my bedroom and I’m in the lounge should speak for itself. Not all of what I’m doing is a waste of time, although I agree the games on Facebook and Twittering about silly adverts probably are! I’ve been reading through this week’s Fiction Friday stories. There are some really good ones this week. And I’ve found a couple of author’s blogs I’ve had to add to my Google Reader (like I have enough time to read the ones I’ve got already!). I’ve also started stressing about how I’m going to find time to write, read all the Fiction Friday stories and other people’s (daily) blogs when I start a ‘real’ (by real I mean busy) job. How do people manage it? I know it’s just a case of managing my time better. Finishing in the evenings an hour earlier than I used to will make a big difference. I’d often feel that once I finish work, get home, (maybe go to the gym,) cook and eat, that I’ve got no time, or am too exhausted to do anything. It’s only an hour, but it will mean that I’ll have all that finished my 8 rather than 9. At 8 I’ll feel like there’s some of the evening left – so will feel like writing (I hope). I think what I really need to do is stop watching TV. When I get home from work, I go into the lounge, chat to my housemate (who’s always got the TV on), sit down and am lost in the cr*p of whatever she’s watching. I never really care what’s on (I always let her decide what we watch – that’s how little I care). Then I go to bed. If I can take away the sitting down stage, but go straight to my room, then I should be able to get into writing and catching up with blogs. It’s just a matter of time management. Something I don’t even try to hide that I’m bad at. At some point in the next few months my living arrangement have to change (housemate’s selling up, and something more fun too, but more of that further down the line) so hopefully I can use that as an advantage too. One of the blogs I discovered today is Agatha82‘s. One of her recent blogs was about joining a writer’s group. Yep, that’s raising its ugly head again. How long ago was it I said I’d look into that? And how little have I done. Hopefully the move to a new job, with an earlier finish time will inspire me to do this. I really feel like it’s something I should do. OK. Enough procrastinating. I must go edit this chapter. I’ve cut a massive section off the beginning, which means that one of my favourite bits can be in the first chapter – in fact, be the end of the first chapter. My problem is that it doesn’t end on a cliffhanger. I would’ve liked it to. But it doesn’t, and I don’t think I can get it to. I guess that’s not a bad thing, I’d just love to leave the reader desperately wanting more. Oh well, lets hope the characters will be enough to get people wanting more! Just quickly before I go and do my ironing edit the chapter, I’ll share a big problem I’ve got with the novel. My MC’s name is wrong. I thought it was a great name for her – mid 30s, quite sensible, workaholic. BUT, I’ve just realised, that’s not her (through her actions I’ve realised that) it’s just the role she’s been playing since her husband left her for someone else. The name doesn’t suit her. 53,000 words later I realise that. Seriously! I’m toying with Mel. Melanie. But not sure. Oh no, I’ve got four days to work it out. Right. Now for the bathroom cleaning and washing editing! Oh I’ve just realised how cool that’s going to be. At 0.01 tomorrow morning, I’ll have a blog posted here, Twitter will link to it, and if I put the hash tag in the title of the blog, it will also link to the tag #fictionfriday. All while I’m asleep (or not asleep, as I’m on holiday from tonight I imagine I won’t be sleeping at that time). So yeah, I go away tonight. In fact, in an hour I’ll be on my way to the station. I can’t wait. 4 days of no work. Woop! I’ve briefed my cousin on the fact I want to get some writing done and read quite a bit. She’s fine with it and going to do some uni work while I do my stuff. Result. Just need to somehow get my aunt occupied too and I’m sorted! So I guess that’s it. There’s no internet at the flat we’re staying at, so I doubt there will be any blogs until next week. But, apparently there are internet cafes in Bournemouth so you never know! I got told off yesterday by my ex for not updating my T&SRC (Thriller & Suspense Reading Challenge) page. A while ago I asked him to add more linky things (I can’t get my head around it, and with a friend like him, I luckily don’t need to! ), and he did. And I’ve done nothing with them. So today, like a good little girl, I made a list of all the novels I’ve read for it, and which ones I need to review for the challenge. Uh.. well… I need to do three. Ugh. I’m not the world’s biggest fan of book reviewing. I don’t know why, I’m just never sure what to write that doesn’t consist of ‘I love this’ or ‘I really liked that’, I think I always sound uneducated and ridiculous (not really selling my blog here for when I do a review am I?). I think it’s one of those the more you do the better you get things. With three books to do (plus another when I’ve finished my current book) hopefully I’ll get better at it – and more confident. It’s not brilliant, but it’s pretty good. 4 out of 7 items done. I’m happy with that. It’s it so predictable the writing course items are the ones not done. I’ll try to get some done after the gym tonight! The whole finish the story for FF is a little unfair not to cross off. True, I’ve not finished it, but I have written 1200 odd words towards it – it’s turning into something much bigger than I thought it would be. I’ll have to finish it tomorrow, but inside I FEEL like I’ve ticked it off. Also today, I’ve spent quite a lot of time on Twitter and Google Reader, reading and commenting. I’ve not done much commenting for a while and I miss it. I’ve done lots today. I don’t think I’ve written about how much I love this Google Reader thing. Laura Best told me (and the world on a post which I’m not going to be able to find in the time I have available) about the wonders of GR – how you can have all your blogs you like to read in one place. I’ve always had the WordPress ones here on my blog surfer, but never really followed anyone else’s – cause you know, how would I get to them, know when they’ve posted etc. In fact that’s actually one of my reasons for loving Twitter – some people tweet when they have a new blog (me!). Now with GR I can import (I don’t know if that’s the right word) all the blogs I want to read to one place. It’s AMAZING. Except I’ve not been keeping up with it when I add people so I have like 3 million unread posts. Ok, maybe not 3 million, maybe just 165. That’s enough. Tomorrow I HAVE to enter Rowan Coleman’s Status Short Story Competition on Facebook. I think it’s maybe a month or so since I entered it. That’s bad. I just can’t think of such small stories. I’ll have a long think tonight. Or tomorrow morning. I also need to crack on with Rowan Coleman’s Short Story Competition. The real one to win mentoring with her and stuff. I don’t know why I can make myself sit and write 1200 words for a ‘nothing’ story, but when I have one I NEED to write for a competition, I can’t make myself sit and do it. I think the fact that it is such a SOMETHING story is a bit scary, so I keep putting it off for other things I say I ‘need’ to do. I notice my excuses for not doing it get more varied every day. I’ll be so mad at myself if I don’t do it. Tomorrow. I will do it tomorrow. Or over the weekend. I need to check the closing date actually. I think it’s about a week away. Eek. Oh well, at school I always left things to the last minute and I got through – I’m sure I can pull this off!